Osborn Seed provides corn, soybean and wheat seed. Click on the links below to find out more information about each product line. Corn - Conventional, IMI, RR and Yield Gard hybrids available. Soybeans - Roundup Ready Soybeans available. Wheat - Agripro and Sunstar wheat varieties available. 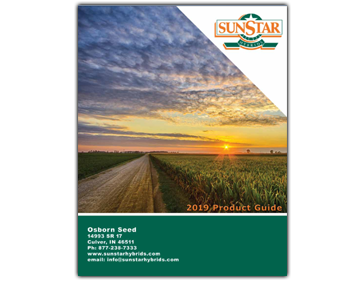 We are excited to introduce our 2019 product catalog. Click below to view our catalog in pdf format. Feel free to give us a call if you have any questions on products. © Sunstar Hybrids. All rights reserved.